October 10 marks the opening of an exhibition that analyzes Philadelphia's growth across more than three centuries, presenting more than 80 rare and revelatory prints, photographs, documents, and maps from the Free Library's Special Collections and Research Departments. 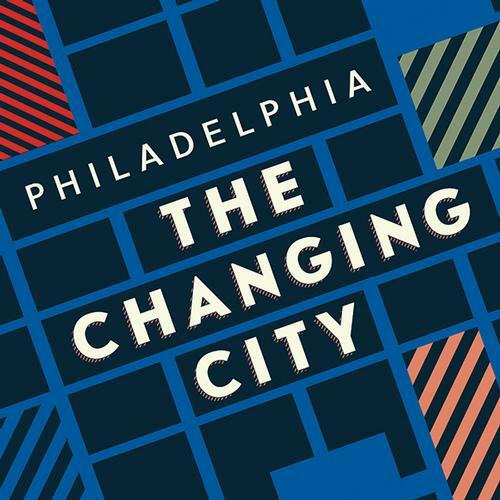 Philadelphia:The Changing City will be on view in the Parkway Central Library’s third-floor William B. Dietrich Gallery from October 10, 2018 through April 13, 2019. The Changing City will illustrate and discuss Philadelphia’s origin as a carefully laid-out grid of streets and squares set between the Delaware and Schuylkill rivers; its distinctions as "a city of homes" and "a city of neighborhoods"; its role as a living laboratory for city-planning, urban-renewal, and historic preservation; and its recent history as a once-declining city experiencing a dramatic renaissance marked by an influx of new residents and businesses, booming tourism, and growing educational, health, and cultural institutions while struggling with persisting poverty, new tensions around gentrification, and an aging infrastructure. Thomas Holme's 1683 plan—a landmark example of urban design—for Philadelphia, which William Penn envisioned as a "greene countrie towne" between two rivers. Holme was William Penn’s Surveyor General. Copies of this plan were included in a pamphlet in order to entice people to purchase lots in the new city. Philadelphia painter and printmaker Augustus Kollner’s 1841 watercolor showing a peaceful view of the Delaware River looking north to the busy port and an island to the east of the city that was later removed to deepen the channel for larger merchant ships. An 1897 cycling map, printed by the League of American Wheelmen, to assist bicyclists competing for road space with horses, wagons, and streetcars while trying to avoid streets paved with Belgian block. As this map shows, enthusiasm for the bicycle is far from a new fad in Philadelphia. A 1918 cartoon by Charles D. Mitchell captures the seemingly capricious changes made in the name of progress—showing a theater replacing an office building and an office building replacing a theater, it asks "Why do they do it?" For more images from this exhibition, visit our Changing City Digital Collection. The Rare Book Department galleries, including the Dietrich Gallery showcasing Philadelphia: The Changing City, are open to the public from 9:00 a.m. to 5:00 p.m., Monday through Saturday. A guided tour of the department’s general collections and the William McIntire Elkins Library is available at 11:00 a.m. every day. For more information on the Department, please visit freelibrary.org/rarebooks or email erefrbd@freelibrary.org. Benton Spruance. Changing City. 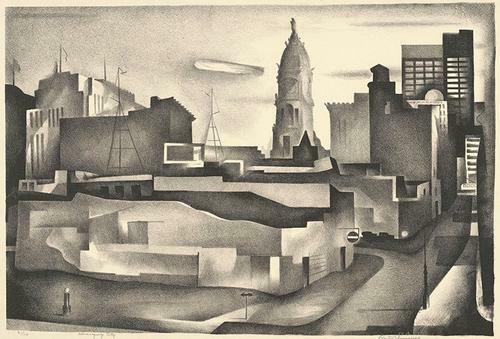 Lithograph, 1934.